Diabetes is a chronic systemic disease that can be managed with diet, exercise, and medications if needed. There are two types of diabetes; juvenile/type 1 diabetes and adult-onset/type 2 diabetes. Type 1 diabetes is usually diagnosed in children and young adults and only makes up 5% of the overall diabetes population. In Type 1, the body does not produce insulin which is needed to break down sugar and starches and convert them to energy for daily life. Type 2 diabetes is the most common form of the disease. In Type 2, the body does not use the insulin properly called insulin resistance. At first the pancreas over produces insulin to attempt to keep blood glucose levels down, but over time it cannot keep up and glucose builds up and causes your cells throughout your body to be starved for energy. Particularly, high glucose levels can damage your heart, kidneys, nerves, and eyes. With regular yearly eye exams, most diabetic eye problems can be caught early and be treated right away. If you notice decreased vision, you should call your eye doctor and make an appointment to be seen urgently for a dilated eye exam. When blood sugars rise for prolonged periods of time, the lens inside your eye can fill with fluid and swell causing blurred vision. With diet, exercise, and treatment the swelling can subside and vision can improve. Sometimes, diabetes can cause cataracts to occur earlier and more rapidly than normal. 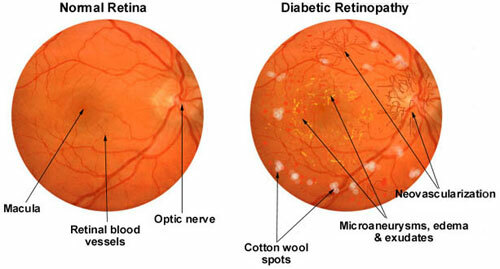 Diabetic retinopathy is another complication from diabetes and uncontrolled blood sugar levels. Early damage is usually asymptomatic, so it is highly recommended to get yearly dilated eye exams with your optometrist or ophthalmologist for early detection and treatment to limit visual loss and permanent damage. There are two types of diabetic retinopathy; nonproliferative and proliferative. Nonproliferative diabetic retinopathy (NPDR) is the most common form. This occurs when small blood vessels in the eye begin to weaken causing microanuerysms to form and leak fluid into the retina (the film of the eye that produces the images that we see). There are different stages of NPDR; mild, moderate, and severe. Treatment at these early stages is usually diet, exercise, and medications as needed to control blood sugar levels. The more advanced stage of the disease occurs when these blood vessels begin leaking higher amounts of blood and fluid into the retina. The build up of fluid in the retina and macula (central vision) can cause macular edema (swelling) and is the most common cause of vision loss in diabetics. Proliferative diabetic retinopathy occurs when the blood vessels in the eye begin to close off and the retina and macula cannot get enough oxygen. As a result, vision decreases and new, abnormal blood vessels begin to form which are leaky and can result in vitreous hemorrhages and retinal detachments. The doctors at the Kansas City Eye Clinic are trained in monitoring and treating early diabetic retinopathy. We work very closely with several retina doctors in the city and have Dr. Blake Cooper come to our office every Tuesday morning if you require further treatments such as laser, surgery, or injections for more advanced nonproliferative or proliferative diabetic retinopathy. Please call us at 913.341.3100 to schedule an appointment or request an appointment here. You can learn more about Diabetic Retinopathy at the following patient education websites. These should only be used as a reference and not as a method of diagnosis or treatment. Please consult a medical professional for an evaluation.